Most 360 cameras with two lenses have unstitched files that are double circular fisheye format, either as separate files (as in the case of the Virb 360 raw files) or as a single video (as in the Samsung Gear 360 or Xiaomi Mijia Mi Sphere). Most cameras have stitching apps, but some do not, and sometimes there is a need to use third party stitching software. Radu Plus posted a tutorial for stitching 360 videos for free using Kodak Pixpro’s stitching software. Here is the video tutorial by Radu Plus. Radu has used this software to stitch videos from the Xiaomi for example. 3. You need to fix the metadata in each video file. To do that, open each file in Pixpro 360 desktop desktop software by clicking on the hard drive icon in the Pixpro 360 software. Set the mode to global and export. That’s it! You should have a fully stitched equirectangular video. Note: Radu will make another version of this tutorial that uses Davinci Resolve. When he has the video, I will update this post. You can bookmark this post to make sure you don’t miss it! anyone on a mac who gets this working – please let me know your workflow – begs! lolz. Hi Tony. Ulf Brusquini has been able to stitch at full resolution with Muvee stitcher. https://plus.google.com/100337880198351960893/posts/VZWo1duGSc5 You might want to ask him for his template. Also, does Dashwood have stitching tools? is this software only sue for Kodak 360 camera? how about others? Hi John. 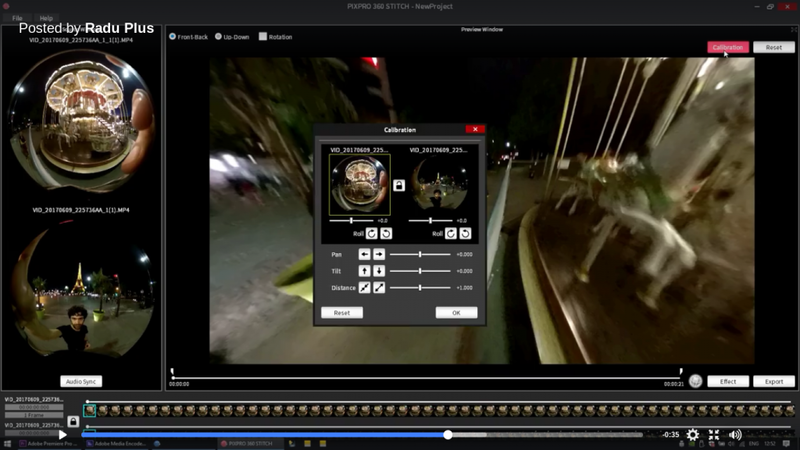 If you use the process here, you can use it with any 360 video from any camera. Opening the file in the first program changes the metadata so that it will be accepted by the stitching program. +360Rumors.com I tested this, it did not work in Mac for me but worked in Windows 10…kind of… I got very bad and narrow stitch, but there was not more video to zoom out/use in the Xiaomi spheres. Will just mention that: The first cropped Xiaomi rectangular videos must be H264, progressive files and in the same folder before opening in PIXPRO_SP360_4K. Then the injected files from that software must also be in a separate folder before opening in the PIXPRO_360_STITCH software. Otherwise I couldn’t get it to work and the stitcher would not recognize the files at least in my case. Thanks for sharing these tips Ulf! Could this be used to stitch Virb 360 raw videos to 5.7K videos? Any luck on 5.7k videos? +360Rumors.com What makes the Pixpro software not work with the Xiaomi is because the pixpro ‘s got a 235° lens…so the software is made to stitch videos from a 235° lens….but the Xiaomi only 190°. To use a specific cam’s software with another cam means it has to be made for a similar lens. Muvee is made for Gear 360 180° lens and is close to the Xiaomi’s 190° lens and that’s why it works almost perfectly. Otherwise it will not work – you need (45°) more video, so to speak. You can clearly see in Radu Plus video that his stitched example video (carousel) also’ve got very narrow/bad stitchlines. So, not worth playing around with the Xiaomi videos with this software… Sorry…but maby the LG360CAM with a 206° lens or similar would look better. Hi Shawn. Did you do step 3? That’s the step that fixes the metadata. Yes… I went through all of these steps several times… I tried three different ways… straight from the camera, exported from 360 Fly app and a trimmed version from QuickTime. I wonder if the codec is different or resolution.